If you breath deeply anywhere near the banana shrub you will realise why it acquired its fruity common name and a closer examination of the flower will also show its similarity to a magnolia. 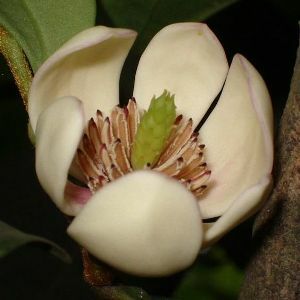 Botanists have recently renamed this tender Magnolia relative Michelia figo as Magnolia figo. This evergreen bush or small tree will grow happily in a cool frost free glasshouse, which it will fill with scent in late winter. Prune only to restrict its growth in confined spaces. It will flower profusely, each flower lasts only a day or so, but the masses of buds in the leaf axils (in contrast to the terminal flowers of most magnolias) promise many days of heady perfume to follow.